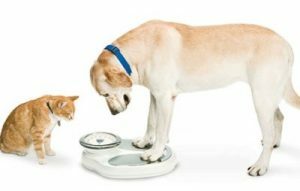 According to the Association for Pet Obesity Prevention, more than 50 percent of the nation’s cats and dogs are overweight. And just as concerning, more than 90 percent of their owners don’t recognize that their pet is carrying around extra pounds. Not unlike humans, pets can face obesity because of too much food and too little exercise, says Eve Flores, a veterinarian and co-owner of DTLAvets with Leia Castaneda. Many pet owners do not take their dogs or cats to the veterinarian until something is wrong. “We can’t practice preventive medicine if we’re not seeing the pets,” Flores says. “The most important decision a pet owner makes every day is what they feed their pet,” Ward says. Flores encourages pet owners to look at the ingredients listed on food packages. If any of the first three items is unpronounceable or hard to understand, don’t buy it. “Pay attention to the amount you’re actually feeding your dog,” Castaneda says, adding that owners should be aware that treats have calories too. She also says that diet food and pet foods that are grain-free or raw have become marketing tools more than healthful alternatives.